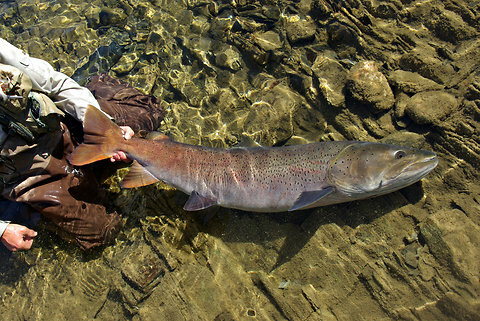 The blog entry above looks at efforts to protect "river wolves"- 100+ lb salmon (not to be confused with Peruvian otters and Canadian River Wolves) found in China, Russia, and Mongolia. These huge fish take years to mature, and breed very slowly, making them an especially vulnerable species to over fishing and loss of habitat. They exist in pretty remote areas, so studies have been limited, but it's believed that these fish can live 30+ years. These animals are just now listed on the "Red List"- which is an international watch list of species that are in peril and need to be watched more closely. Being included on the list doesn't necessarily do anything to protect the fish, but this blogger seems to think it's a step in the right direction. In truth, it's hard to know how many fish species should be included under the category "endangered" or "threatened" because we know so little about underwater creatures. Fish are notoriously hard to count, and deep sea species, or species that exist in remote areas such as the river wolves, are hard to count. Almost as difficult, is to judge their current numbers against a baseline (or point of reference) for comparison. If you see some fish now, how many might you have seen 10 years ago? 15 years ago? 100 years ago? For many species, this data just does not exist. For an idea about how investigators establish baselines, take a look at this publication outlining the establishment of baselines for tropical fish in Florida reefs over a 20 year period. In this study, SCUBA divers visited established underwater points throughout the year. They visually counted and recorded the number and type of fishes they encountered. This method is possible because of the clarity of water, but is not necessarily an option for establishing baselines for all marine organisms. It also presupposes manpower and access to areas that these animals visit. For the other species, such as the "river wolves," investigators might pay more attention to folk stories or family histories of how many fishes were caught in the past. While this might seem like a less precise measurement than the Florida study, it is a form of data that scientists can utilize to gauge population decrease over time. It makes sense that many fish species don't show up on "endangered species" lists until there are few left. Even then, it's difficult to gauge the decimation of the actual population. But, we know that fish species, especially edible species, are consistently over fished and under protected. Let's hope inclusion on this list leads to conservation programs that bolster the population of huge fishes without alienating the native peoples that rely on them as a food source.